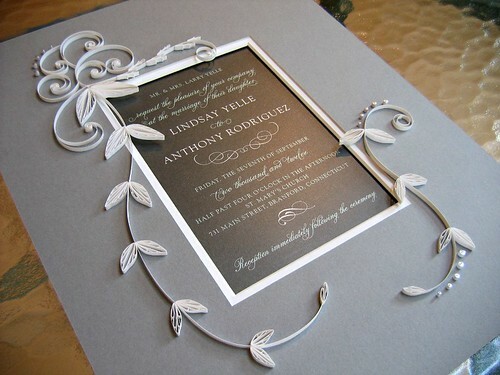 A few recent projects... first up is an ornate wedding invitation for which I quilled a mat. One of the most amazing invitations I've seen, it was designed by Spark Stationery. The paper was luxurious and the laser cut, pearlized wrap was actually larger than you see here... the two sides folded over the invitation. Concerned that the overall design would look too busy, I reduced the size of the laser cutting and kept the quilling fairly simple. 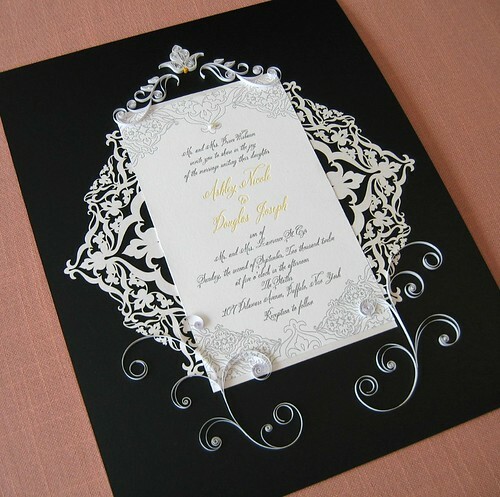 The paper filigree at the top and two flourishes at the bottom echoed the letterpress printing and the triangular shape of the laser cutting. The tiny coil of yellow was a nod to the color of the couple's names. I used specialty white quilling strips that have a subtle pearl edging... it's lovely paper from JJ Quilling Design in England and is available in the U.S. from Whimsiquills. This next invitation is a quilled design I've shown before, but in this case the mat was 11 x 14 inches. I like the versatility of this standard size because it's large enough to look nice either hung or displayed on a table or mantel. The invitation I did previously with this design was square and required custom framing, but a ready-made rectangular frame is a less expensive option. As it turned out, the client decided to have the invitation custom framed because she wanted it to look its very best. I like to attend StampinUp! camp from time to time to keep up with what's new in the rubber stamping world. A while ago we made explosion boxes that are pretty clever. I've been saving this one for just the right gift ever since, and the occasion came along this past weekend. You know the saying... good things come in small packages! 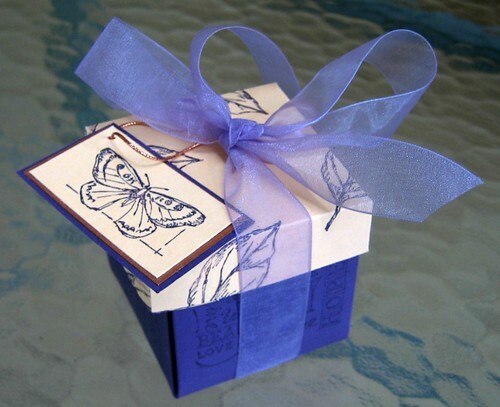 When the lid is lifted off, the folded sides of the box fall open in a neat way. There are quite a few YouTube videos that show how to make one. I just noticed on Custom Quilling's page that Paplin Papers has a brand new line of vellum quilling strips. I haven't seen them in person yet, but no doubt they'll give a beautiful, translucent look to a design. Cutting vellum with my paper trimmer dulls it in no time, so the idea of pre-cut strips is appealing. The strips are quite long at 25 inches and they come in enticing colors like Frosted Glass, Gold Dust, and Peacock. Thanks Ann for sharing your new quilled wedding invites. Your style is modern, fresh and beautiful and they make a lovely keepsake for the couple. 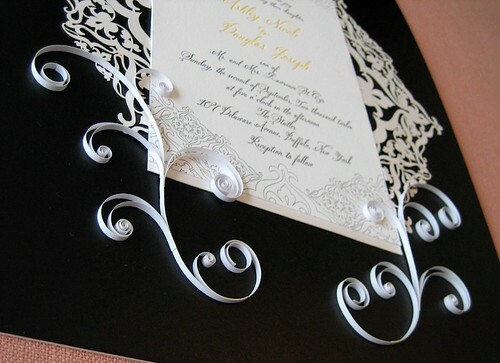 I adore your alternate side loopings and the way you have captured the design of the laser cut invite in your quilling. Thanks also for the tutorial link. Thanks Licia, that's so nice of you to say. 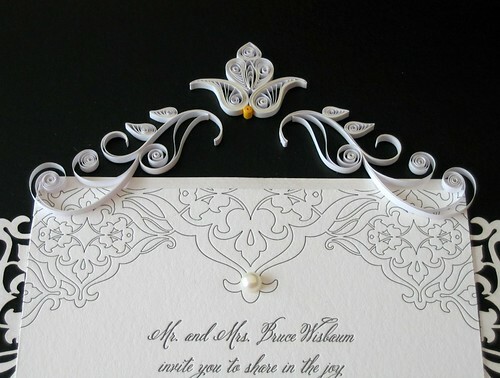 Beautiful Quilling- I like the subtle pearl edge with the simple white, very lovely. Thanks Meg, the pearl-edge paper was so nice to use... something a bit different. Oooh, I love all our quilling work. The wedding invitation are lovely. I like how thoughtful you are about making them like the little yellow quilling reflecting the color of the couple's names. What a beautiful box. The recipient will definitely be happily surprised! Again beautiful and flawless. I only wish I could see it in person to really take it in. Wow! That's one very fine work, Ann. Very lovely. Thanks for sharing the Exploding Box Tutorial Link. Gonna try it this weekend. Thanks Sylvia! I hope you'll give the tutorial a try. The one I made didn't have the extra interior layers, but either way, it's a neat little box. You always do such beautiful work, I always look forward to seeing what you have done. Since I am the recipient of the folded box, I can vouch for its cleverness. Pretty cool contents, too! Thanks, Ann! Such elegant and perfect scrolls Ann, How cleverly you match your quilling with the background. Thanks Suganthi, I have to admit it took a great deal of experimenting. Thanks Soraya, and you're welcome! I still remember discovering your blog via a blog post on a quilled marriage certificate! And I'm so glad you did, thanks Lissa!